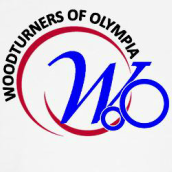 Interested in joining the Woodturners of Olympia? Please feel free to visit a meeting or two. We think you’ll like the experience, the friends and the fun. If you are interested, dues are $25 annually valid January 1st to December 31st and can be paid at the meeting to the treasurer. You can also pay right here online through PayPal using your PayPal account or your credit card. • Live turning demonstrations at our monthly meetings featuring well known turners. • Around the Show and Tell table, you can swap experience and knowledge of woods, tools, techniques, sharpening and finishing. • Our collection of books, magazines, and videos is constantly growing – and covers all stages of experience in woodturning: from beginner to expert; from pens to bowls to hollow forms. All library items are available for borrowing by WoO members. • Some of our more experienced members generously volunteer to act as mentors to other members. If you need help with a project or have a woodturning questions, find a mentor at our monthly meeting. You can also find a Mentor by clicking Here.